Go to: http://www.google.com/alerts. 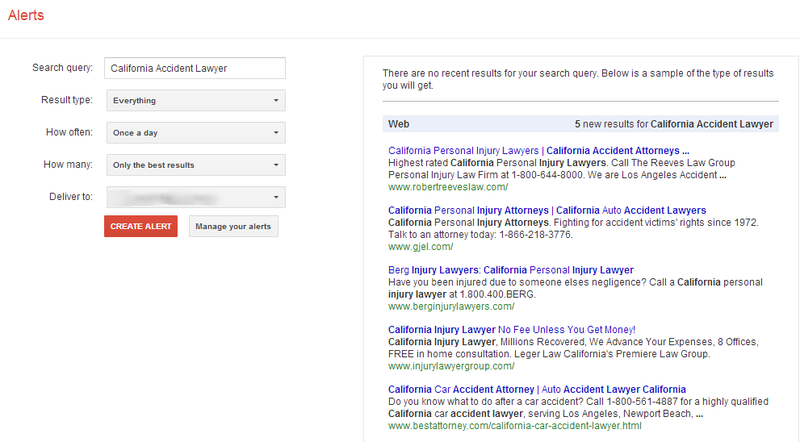 This will bring you to the Google Alerts home page. Decide what keywords you want to focus on. This step is very important because it tells Google exactly what you want to search for. What company brand names do you care about knowing real-time, daily, and weekly information on? Is it just your own company or do you want to keep an eye on a couple competitors? In your particular industry, what are significant keywords that revolve around your industry? What are your customers typing into Google that you care about? Look at your Google Analytics data to get some ideas. If you are not already signed in, enter the email address that you would like the Alerts to be sent to. Press the “Create Alert” button to set up your first basic Alert. 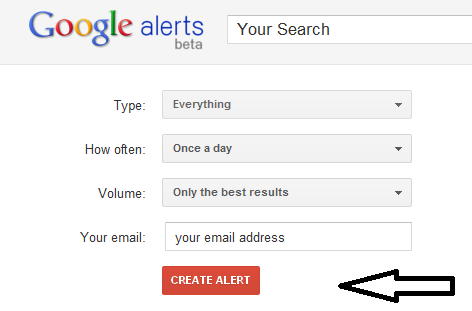 There are some options available to modify your search to make your Alert more specific. The first option is “Type” and the default is “Everything.” The other options are News, Blogs, Video, Discussions and Books. If you narrow it down, your results will be limited to a specific source type. The next option you have is “How Often” you would like your Alerts to be sent to you. You can choose to have the Alerts sent to your email as it happens, once per day, or once per week. Your last option is “Volume.” You can choose to only receive the “best results” or “all results.” If you think your search term is going to return a lot of results, it is probably wise to only be sent the best results for your search terms. Once you have created your Alerts, you can “Manage Your Alerts” in one place.